Floods and flash floods occur every year in the Mid South. River flooding occurs seasonally when winter or spring rains or torrential rains associated with tropical storms fill river basins with too much water too quickly. Flash floods occur suddenly, usually occurring within hours of excessive localized rainfall. These flash floods can become raging torrents which rip through river beds, urban streets, or valleys sweeping everything before them. 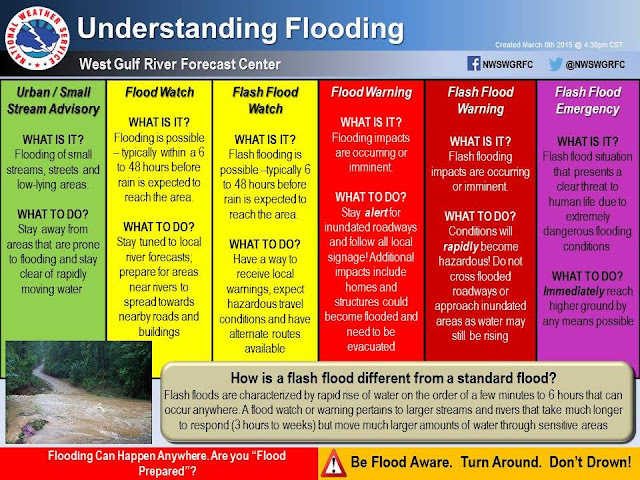 When a Flash Flood Warning is issued for your area, or the moment you first realize that a flash flood is imminent, act quickly to save yourself. You may only have seconds. 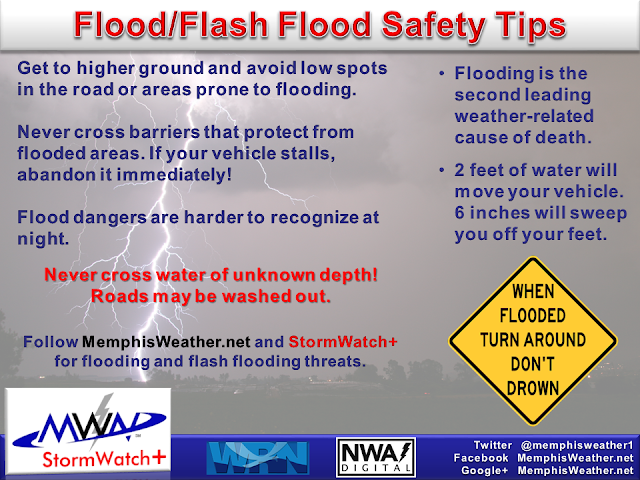 A Flood Watch means it is possible that heavy rains will cause flooding in the specified area. Stay alert to the weather, and think about what you would do if water begins to rise or if you receive a warning. Watch for development. Sometimes, an Urban and Small Stream Flood Advisory (or Flood Advisory) is issued for urban areas when excessive rain from thunderstorms begins flooding low-lying areas, small streams, and areas prone to excessive runoff on roadways. Be especially cautious when driving heavy rain and avoid areas where water is known to pool or flood during heavy rain. It only takes two feet of moving water to sweep your vehicle away, including pickups and SUVs and six inches of moving water to sweep a person off their feet. 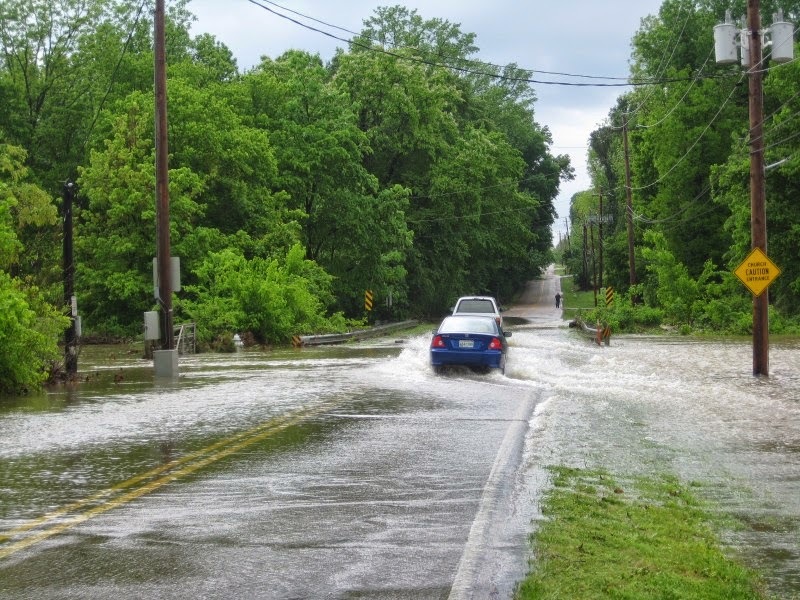 Nearly half of all flood fatalities involve vehicles. Get out of areas subject to flooding. This included dips, low spots, valleys, stream banks, and flood plains. Avoid already flooded and high velocity flow areas. Do not attempt to cross a flowing stream on foot where water is above your ankles. If driving, know the depth of water in a dip before crossing. The road bed may not be intact under the water. Don't drive into a pool of water or where water is flowing. Water up to the bumper will likely stall a car. If the vehicle stalls, abandon it immediately and seek higher ground. Rapidly rising water may engulf the vehicle and its occupants and sweep them away. Be especially cautious at night when it is harder to recognize flood dangers. Heavy rain events frequently occur at night! Do not camp or park your vehicle along streams or drainage areas particularly during threatening conditions. 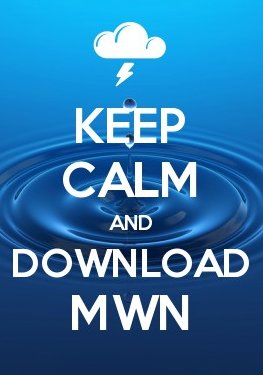 MemphisWeather.net has the information you need during potential and ongoing floods and flash floods via the MWN Flood Center, which includes current radar and estimated precipitation totals, precipitation forecasts (amounts and timing), and river levels and forecasts. In addition, StormWatch+, available via the MemphisWeather.net mobile apps for Android and iPhone, will alert you if you are in, or drive into, an area that is under a Flash Flood Warning.